Video games are an investment on two fronts: money and time. While I value a game respecting my time more than my wallet, others prefer to have as little money involved while playing a game, and that’s why free-to-play titles have become a successful niche. The latest high profile title that doesn’t cost a dime to download is My.com’s MMO Skyforge, which I’ve been able to check out in beta form over the past week. While this meant that I couldn’t do much in terms of the game’s multiplayer (shockingly, it’s hard to test when so few are playing), I did get to better understand what makes this MMO different from the rest of the genre. 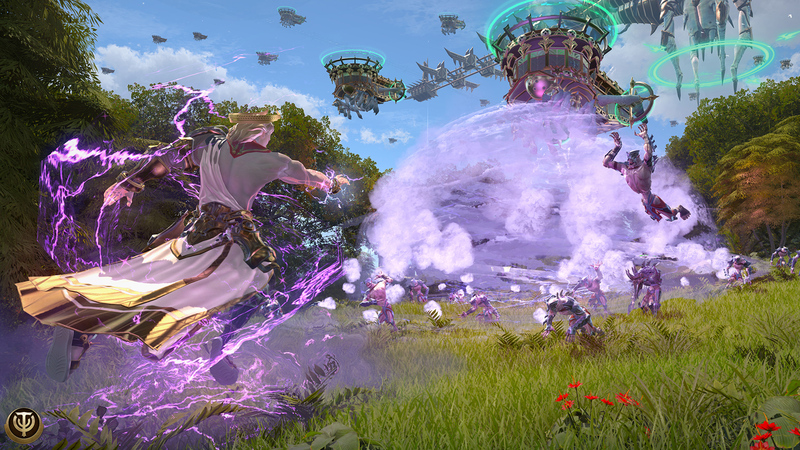 The one major thing that differentiates Skyforge from most other MMOs is how the game handles combat. Most games in the genre have players attacking automatically, thus letting the player focus on deploying skills and managing cooldown meters. Here it’s different, as the combat is modeled after a character action game. Upon choosing the powerful Paladin class (the other two classes available at the beginning are the highly damaging Cryomancer and the support role of Lightbinder), I was able to chain together attacks into different combos by mashing together square and triangle. This change is a smart one, as the active combat system made sure I always participated in battles. This is a far cry from other MMOs (and even JRPGs) where I barely paid attention during most fights. My character, the mighty warrior Bojangles, quickly had a bunch of different combos to unleash against the foes I’d come across in each level, and was able to dash away in order to avoid attacks. It’s certainly not as deep as Devil May Cry, but the action was fast and fun. It only took a few minutes to realize that Skyforge isn’t the most heavily polished game in the world. My character’s eyepatch would randomly disappear during certain conversations and cutscenes (thus eliminating my imaginary backstory that Bojangles had lost an eye in a tragic billiards accident), the voice acting was pretty horrendous in spots (especially for filler dialogue), and the animation often looked rough. For the most part I found the jank to be entertaining instead of frustrating, but it’s still not the look that any developer wants for their game. Despite these issues, I found myself having fun while adventuring throughout the world’s different areas. There’s no giant open-world to explore in Skyforge, as players instead travel to different isolated areas that vary in shape and scale. Some I encountered were larger zones that had multiple quests to delve into (although almost all of them were solved by killing specific enemies or collecting items), while others were very linear levels where I had to get my character from Point A to B, and then battle a boss. Due to the real lack of variety in quests, it’s probably best to play Skyforge in shorter gaming sessions as to not get burnt out. The general combat was fun enough for me to not get bored during my time spent with the game, but I could see the game getting monotonous over time. That’s a challenge that all MMOs face, and even a more active combat system can’t save this game from it when the quests feel generic. It doesn’t help that there’s no real solid story payoff as the dull dialogue went through one ear and right out the other, and I wasn’t invested in the world at all despite becoming an “immortal” after the in-game tutorial. Due to the lack of polish, Skyforge can’t really compete with the top games in the genre like World of Warcraft and Final Fantasy XIV. The good news is that it has one major advantage on those games, and that’s the fact that it’s free. There is a premium service that can be purchased, which will give players additional rewards for quests and the ability to level up new classes more quickly, but it’s possible to experience every part of the game without spending a dime. It’s free-to-play done right, and players won’t have to deal with obnoxious microtransactions popping up constantly. 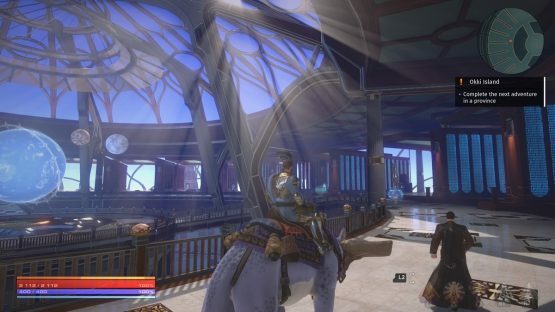 With no monetary investment required, it’s a lot easier to look past the issues that Skyforge has. While the amateur sounding voice acting may be slightly annoying, it’s nothing bad enough to take away from the satisfying combat that pops up during every quest in the game. Sure, most of the quest design feels like busywork, but quickly marking off checkboxes feels gratifying, and it makes for a solid gameplay loops since the player is constantly moving on to a new goal – even if it’s just defeating a different set of enemies. It may not have a great storyline or something new to offer the genre, but Skyforge is an enjoyable MMO. If you’re looking for some fun, straightforward action, and hundreds of basic quests to accomplish, this’ll certainly scratch that itch. It may not challenge the likes of Final Fantasy XIV, but when the price of admission is completely free, it really doesn’t have to. Beta code for Skyforge provided by publisher. Previewed on PS4 Pro.